Reading at night can be a bit challenging, particularly when you’re trying not to bother a sleeping partner. That’s why we’re here! We’ve put together this list of the ten best reading lights so that you can experience your favorite bedtime reading without disturbing anyone. Before we get started, here are some things that you need to know. Afterward, be enlightened by our excellent list of reading lights below. Power: How does the light receive power? Does it plug into the wall and get electric power, or does it have a battery that recharges or needs to be replaced? 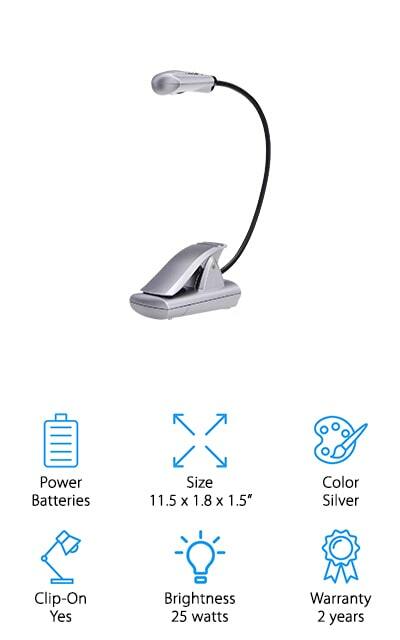 Some of these lights even charge with a USB cord. Size: These are the dimensions of the reading light. This will tell you where the light will fit, including telling you if it’s a lamp you will place on a table or clip to the top of your book. Color: What color is the light? It’s important to some people that the reading lamp matches their decor. We’ve provided this information so that you can choose the best fit if that’s something that’s important to you. Clip-On: Clip-on lights will have a clamp on the end that allows you to attach it to the tabletop or to a book so that you have an easier time reading it. This makes it portable! Brightness: How bright does the light get? You might want a dimmer light for bedtime, or you’ll want a light that’s really bright so you can see the pages better. It’s entirely down to personal preference. Warranty: The warranty will help you replace your light or get a refund if something goes wrong. During this period, any defect due to manufacturing error is covered. It’s like an insurance policy for your purchase. Now that you know all that you need to know about reading lights, we can start to show you the products. These lights will keep you up all night reading! With the different brightnesses and colors represented here, you’re sure to find one that will fit your life. Our top pick and budget pick are our favorites, but shine a light on the rest of the list for some amazing reading lights. One of the best reading lights for bed is this one by acegoo. It’s a bedside light that you attach to the wall or headboard on your side to shine down on your book. It’s a warm light that sheds a narrow beam of light right where you want it, so it won’t disturb your partner in the middle of the night. It has a completely flexible gooseneck that you can adjust to different angles depending on where you’re positioned. It’s great for reading while lying down or sitting up because of this adjustability. One of the coolest things about this lamp is the touch dimmer switch, where you can hold down the base switch in order to adjust the brightness level. Choose how bright you want it to be! This nickel-finished lamp is simple and minimalistic, so it will match a variety of different clean decors. For a convenient lamp that will keep you reading, choose this one! This small lamp by LEPOWER is a pretty cool reading light. 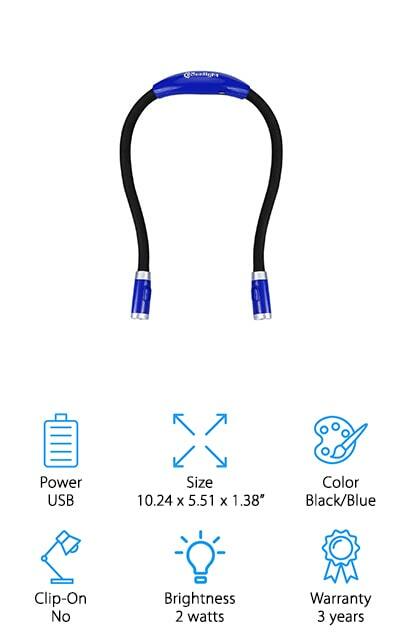 It’s got a long, flexible neck so that you can get the light right where you want and need it so that you don’t bother anyone else. It’s aluminum so it won’t get warm after extended use. The clip is 2.36 at maximum size, so you can attach it to thin headboards or to your bedside table. There are two switches on the cord which allow you change brightness and color of the light. You can change between dim and bright light, as well as between warm light, white light, and completely off. We love that level of customization. 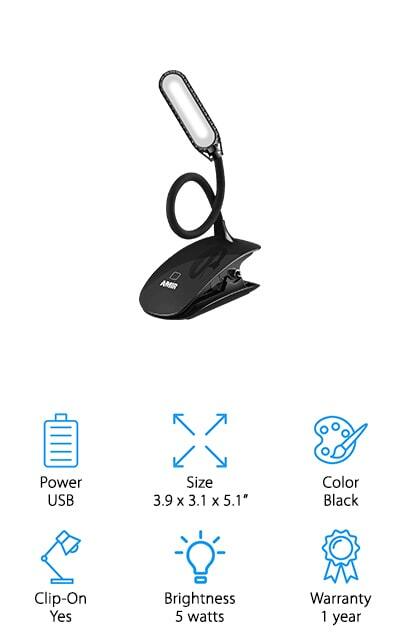 It’s a good reading light for college students because it’s rechargeable via USB so it’s portable and you can plug it in wherever you want. The lamp itself is black so it will go well with just about any design scheme that you’re going for. Fulcrum makes one of the best LED reading lights with the Light It! lamp. We like that it’s not just a reading light, though it’s a great one when you use it for that. It’s also great as a task light, for reading and typing as well as crafting. Take it with you on the go for a great travel light, because it runs off of 3 AAA batteries instead of needing to be plugged into a power source. The heavy-duty clamp will keep the light attached to a variety of surfaces and get the direct, bright light into even the tightest spaces. 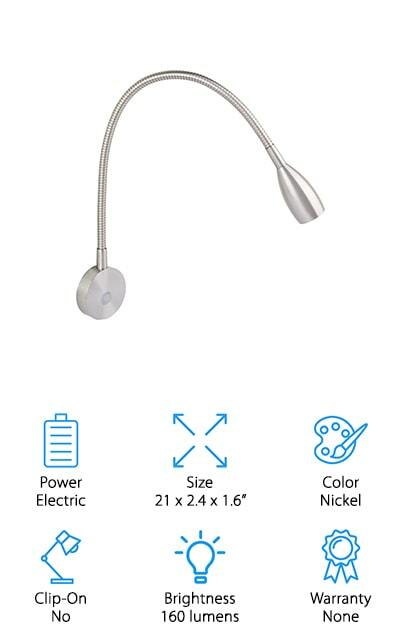 It has a flexible gooseneck so you can direct the light anywhere you need it. For on the go, fixing vehicles or reading while you’re riding in a car, it doesn’t get much better or more versatile than the Light It! lamp by Fulcrum. Illuminate your life in the most convenient way! This light by Ranjaco is one of the best reading lights for eyes because it offers three different levels of adjustable brightness. You can use the lowest setting as a night light without bothering anyone else sleeping in the room. The high settings are great for reading or studying, and they also won’t diffuse out to a greater area. Your partner can remain sleeping soundly while you get a couple of chapters in before bed. It comes with a rechargeable USB battery that you can charge with any computer or with the wall adapter. It’s got the clamp to attach to different surfaces where you need it. It’s 2.36 inches when fully opened so it’s great for some thicker surfaces as well. 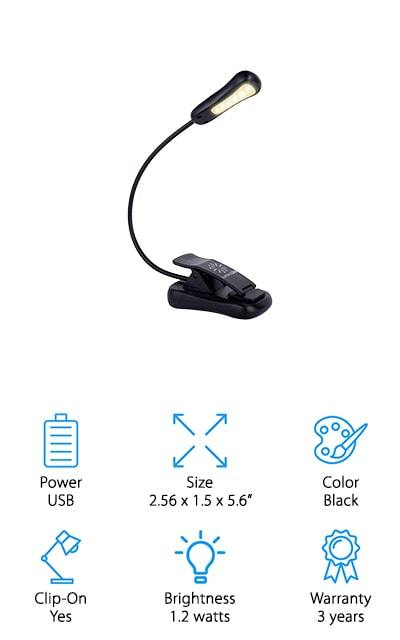 The rotating neck is flexible and allows you to get the light absolutely anywhere! The battery, when fully charged, lasts for a total of 24 hours! That’s pretty amazing for a light that gives out this much brightness! This clip-on book light by Energizer is sure to last you forever! On a full charge, this light from the battery company will last you up 25 hours. That’s a lot of late-night reading sessions on one set! When you need to replace them, make sure to pick up 2 CR2032 batteries. It’s a small light that comes with a flexible neck that you can stretch or collapse to get into even more angles. 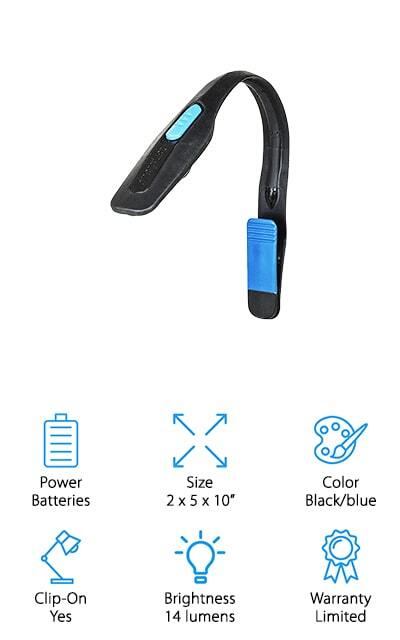 The built-in clip makes it portable, and because it’s on batteries you can take it with you on the road, during camping trips, or for a hotel reading light. It’s a broad beam that you can see, but still narrow enough that it’s not going to disturb your partner or roommates. The clip is small and will clip onto visors and books that are 0.5 inches thick. Use it with all of your favorites, in all of your favorite places! 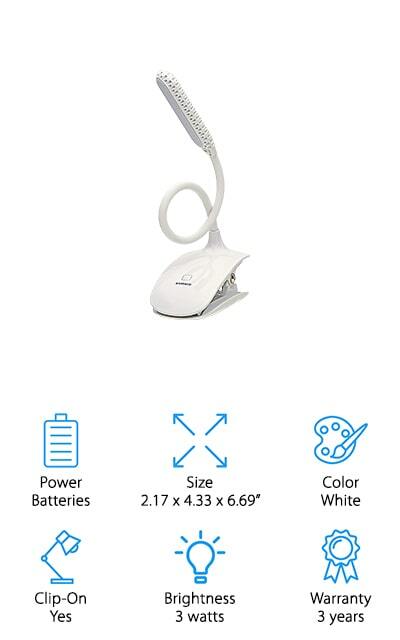 LuminoLite makes this reading light with rechargeable batteries that will definitely come in handy. 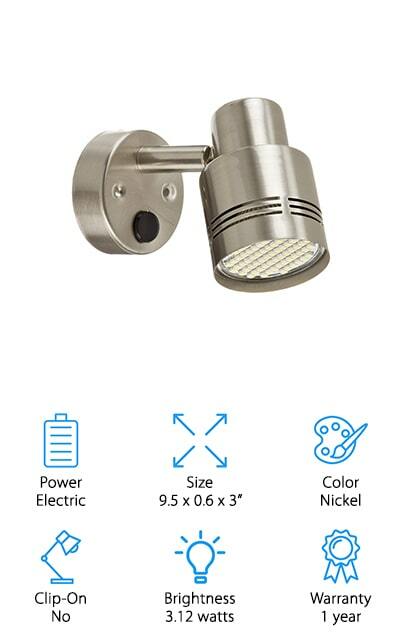 It has three different brightness level, and there are six different LED lights in the head of the lamp to give you a wider lighting area - up to three times the space of normal LEDs. It’s one of the best reading lights for kids because it’s entirely wireless and completely portable. On a full charge, this powerful little lamp will run for a total of 60 hours. That’s quite a lot of reading time! Plus, the light diffuses in such a way that is great for your eyes - it won’t make them ache. 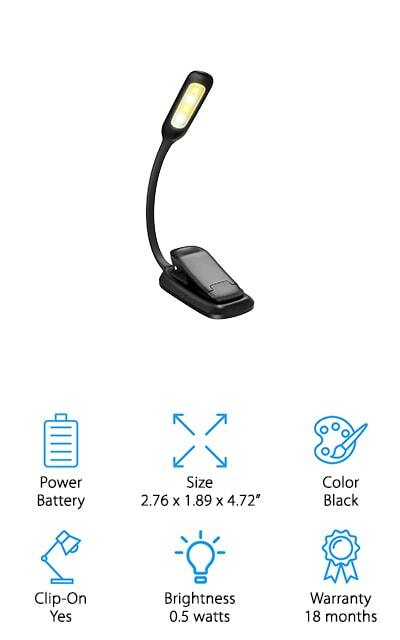 The neck flexes in any position so you can get the angle that you need to stay reading - or doing any other tasks. It’s great for crafts, tasks, and hobbies as well. This light is incredibly versatile, and even the clamp is padded for the best experience! We love it! 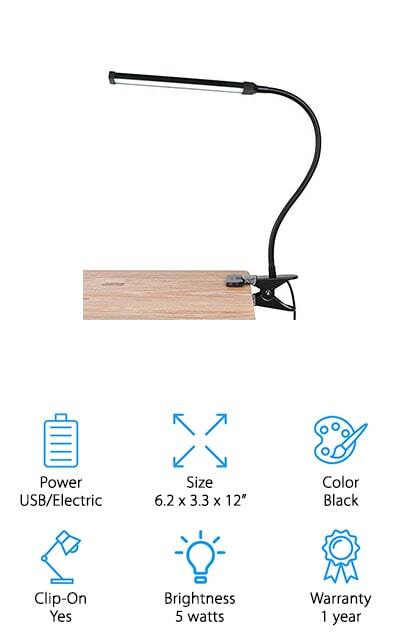 This bright reading light by AMIR has three different levels with a smart dimmer function that allows you to choose the right brightness level for you. If the brightness is too much for your eyes in the dark, go with the next one down - you can read your way! Whether you want it really bright or dim, this is the light for you. It has a 360-degree gooseneck that you can easily adjust to any position that you need for reading in bed. The clamp is wide enough to clip to books, shelves, stands, and cabinets - wherever you need to be able to see. No matter the brightness level, the light is soft, flicker-free, and anti-glare which helps to relieve eye fatigue. This lamp comes with a rechargeable battery that runs up to 24 hours on the dimmest mode and 12 hours in medium light. The brightest setting will get you six hours of light on a single charge. CeSunlight makes easily one of the best reading lights on our list. It comes with a powerful rechargeable battery that will charge in three hours and last up to 8 hours on the highest setting. On the normal brightness setting, it will last up to 10 hours. There are four total brightness levels, and two arms for this light – two LED lamps on each arm. One of these LEDs is a spotlight for focused reading and the other is a wide-angle light. You won’t have to buy the batteries to go in this light which is a huge plus. Each of the arms is made of steel alloy, so they are strong as well as being flexible. They are covered in soft silicone so they are easy to handle and safe to use. This lamp, with both arms and four different brightness levels, is super lightweight. It can be your constant companion on the go. TOPELEK makes this amazingly simple yet surprisingly effective reading light. There are three different brightness settings available, including a headlight with four LED lamps, a white light that uses two, and a warm light that uses two as well. You can choose which one you want with the click of a button, and each one will suit a different need. The gooseneck is covered in silicone, but you can flex it into any position to be able to see exactly what you want without any hassle. It’s got eye protection technology and it won’t flicker, giving you the best experience and the ability to see without harming your eyes. On the lowest setting, a single battery charge will get you twelve hours of lighting. We love that! We appreciate the different brightness levels to suit your needs! Plus, the light can clip on to any surface or even the book you’re reading so you can see perfectly! There is a certain level of class and innovation that comes with this modern reading light from Ming’s Mark. It’s an LED reading light that plugs into the wall. The technology behind this lamp allows it to take on a wider range of voltages, so you can safely use it on your boat or in an RV for reading on vacation. The LED bulb has a life expectancy of about 100,000 hours before it will go dark, which is a lot longer than a non-LED bulb would give you. It doesn’t use a lot of power but delivers amazingly high-temperature natural light. Use this light in the dark and dreary winter days to give yourself a little mood boost while you get lost in your favorite book. In addition, it’s finished with a nice brushed nickel that makes it look modern and clean – perfect for your décor! This lamp will take your reading to the next level!